Benny Hsu shows us step-by-step how he gamed the Teespring system to make a full-time living on the platform. Not too long ago, I knew nothing about running a Facebook ad to sell a product. Okay, maybe I just tried it once. I ran an ad for an iPhone app I had get more users for. I’m not sure if it helped. I was probably doing it all wrong. Still… I tried. One day in March, I came across someone selling a course about how to make money selling your own t-shirts online. This seller was your typical internet marketer. He said how easy it was. He said he earned over $100k in a month. He made it seem like anyone could do it. He knew how to sell. So my eyes got big and I dreamt about the money I could earn if I sold my own designs. Selling t-shirts had been on my mind for many years. I just never thought I could make that much money from it. I bought the course, which was really cheap. The course was just okay, but I knew nothing, so anything was a step up. Soon I had my first t-shirt design uploaded and ready to sell. I created it myself with basic Photoshop skills. I created an ad and started running a Facebook ad campaign. I learned to test it out with a $10 ad budget. If no one bought a shirt in the first $10, then stop the ad. It was a way to test out the design and buyers. My first design got to $10 and no one bought. I stopped it. Still, I was interested in this. I liked the process. I joined a couple Facebook groups to talk and learn from other people. Some were just beginning, some were having success, and some were still struggling. The next 20 designs and ad campaigns failed. I spent $10 each time to test it out, and despite thinking people would love the shirt, no one was buying. The highest I got was three shirts. I thought I had an amazing design and was targeting the right audience. I lost money on that campaign because each day I spent $10 and ran it for seven days hoping at least ten shirts were ordered. The reason I needed ten orders is because the website I was using to print and ship these shirts is Teespring.com. They make it easy for anyone to sell shirts. Just upload a design, set your price, and if at least 10 shirts are ordered, then the shirts get printed and shipped. They handle that. They just send you money. If it doesn’t reach at least ten, no one will get charged and no shirts will be printed. So no upfront costs and no need to keep any inventory. I learned it wasn’t as easy as I thought. I couldn’t just make a shirt and advertise it. Twenty-one failures proved that. I tried selling shirts to dog lovers, coffee lovers, hot sauce lovers, lawyers and more. It would have been easy to quit after so many failures. I wasn’t ready to quit yet. Finally on the 22nd campaign I had a winning design. It was stupidly simple. It was just a cute message I found on Instagram and targeted toward pediatric nurses. It took less than five minutes to create it in Photoshop. Once I ran the ad, I had a sale before I spent $10. After the campaign ended seven days later, I had sold 17 shirts. I spent $81.72 on ads and earned $112.25 for a profit of $30.53. It wasn’t a huge profit, but it was a successful campaign, finally. It took a few more failures before I had another successful design – it sold 32 shirts. Here is that shirt. As you can see, I was targeting butchers. Seeing success made me even more obsessed about this. I stayed up late to research ideas and work on new campaigns. I learned through trial and error. I carried a Moleskin notebook around all day and wrote down t-shirt ideas. First thing in the morning I would check how the overnight sales. The last thing I’d do before bed was prepare new designs to start selling in the morning. After my first full month, I just about broke even. I cashed out $1,106.87 from Teesrping, but paid just about that much in Facebook advertising. Some people might be discouraged, but I was glad I broke even. In the month of May, I kept working hard. I was flat out obsessed with it. All my free time was spent on this. Because I was trying to find the right audience and sell them the right design, I had more failed campaigns than winning ones. But the winning campaigns were massive. The month of May I was finally profitable. I was selling designs that my customers wanted. All the struggling I had before was finally turning around. All the hard work I put in was now starting to show me massive results. The month of May was my tipping point. Since then I’ve been profitable every month. This year I’ve had my best year ever online. Better than any year I’ve had with iOS apps. How well has it done? Up till September 1, I’ve made $152,996.34 off Teespring. That’s my share of the money earned from selling my designs. However, I do have advertising costs. Without spending money on advertising, no one would know about my shirts. I’ve spent $51,024.98 on Facebook ads alone. That isn’t a typo. It’s hard for me to believe because that’s a ton of money. Minus my Facebook ad spend, that’s a profit of $101,971.36. First time I’ve ever hit six figures online in one year. Better than my apps, believe it or not. Life-changing for me? You bet! That’s just in five months. The numbers are staggering to me still. I’m amazed by the results I’ve gotten. I’m proud because the amount I’ve earned is in direct relation to the amount of work I’ve put in. Three years ago, if someone told me I would have earned this much from selling t-shirts I would have said it’s too good to be true. Not everyone selling shirts online is making this kind of money. There are tons of people still struggling. I don’t want to make it seem like it’s super easy. That’s why I’m thankful for the results I’ve gotten. I’m not taking it easy. I put in as much time into the business as ever before. In fact, I’ve stopped developing apps this year. Will I get back to it? I don’t know because right now this is going well for me and I really enjoy it. I started off as a beginner with dreams to make money selling t-shirts. It wasn’t an easy road, but I’m glad I stuck with it. And if you doubt my earnings for any reason, then feel free to click the back button now or close this site. I’m not here to lie. I have no interest in making up numbers. If you’ve read my blog long enough, or have met me, you know I’m not that type of guy. I want to share what helped me go from just starting out to seeing success so you can apply it to whatever it is you want to do. I’m fortunate to have found success doing this. I know people who are designing and selling shirts full time. Some of them are doing this on the side and earning thousands a month in profit. Then there are people making way more money than I am. Like learning this type of stuff? Read The Hustle’s daily email for all the news you need to know. I’ve always wanted to design t-shirts. When I went through idea after idea about what type of business I wanted to start many years ago so I could leave my job, a t-shirt business was one. This was back in 2007 and I was living Taipei, reading about what I needed to print my own shirts. Maybe I could find a local printer, but I would need a minimum number of orders. I looked into buying my own printing press and doing it in my garage. There were websites like Cafepress.com where I could upload my designs, set my price, and earn however much I marked up my shirt. The profit margins seemed so low, though. I also didn’t have an audience to sell my shirts to, and would have to rely on buyers browsing the website. But this idea wouldn’t die. 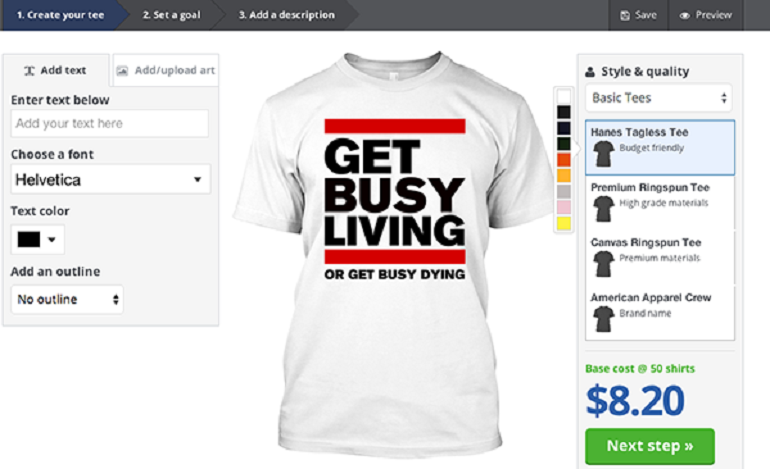 When I started Get Busy Living, I wanted to make a shirt and sell it. I got introduced to a great shirt printing company from another blogger. I made the design myself in Photoshop and ordered 50 shirts. When I got them, it was a great feeling to hold these shirts in my hand. I began promoting it on the blog and got excited when people bought. I’ve sent shirts all over the world, even Singapore and Switzerland. I stopped selling them because I went to Taipei with my wife and couldn’t ship any shirts that were ordered. So I didn’t re-order and when I came back, I didn’t sell them again. I just didn’t like having inventory. Still, the dream of selling my own t-shirt designs to people who wanted them was always on my mind. And that’s why I love the internet. Because now a guy living in Florida can profit $100K in only five months with just a computer. The same guy in Florida created an app for $1,900, hired a company in the Ukraine, and was featured as App of the Week. You don’t have to sell t-shirts. Plenty of people are making money because of the internet. They may be selling books, hand-made crafts, professional services, consulting gigs, etc. This is one of the worst excuses. Starting is the easiest part I think, but so many people use this excuse. I could have easily thought to myself “I don’t know how to start”. It can feel overwhelming knowing nothing, but wanting to know it all. I’ll tell you how I know they are lazy. There’s this website called GOOGLE. Very helpful to learn anything. When I began, I never thought that. Instead, I thought “What do I need to figure out FIRST to get started.” Just like when I learned outsourcing was a way to get my app made, I learned enough to get started. You would laugh if you saw some of the t-shirts I tried to sell. Even I’m ashamed. They weren’t failures. They were learning experiences. I’ve had designs that I thought would be winners, but turned out nobody wanted it. That’s hard to take, but I just had to move on. I wouldn’t have had the success if I didn’t screw up. Mistakes taught me something every time. When I began, I didn’t try to be perfect. My first campaign was a dud. So were the next 20. Too many people want everything to go perfectly. They want the very first business they start to be a huge success. They want the first book they write to be a best seller. That’s aiming for perfection. Trying to be perfect will kill many dreams before they even begin. $101,971.36 is amazing, but it didn’t come because everything has gone perfectly. I think about t-shirts from the time I wake up till I go to bed. Anything that I’ve done since 2011, I would say I’ve been obsessed with it. Finishing my first half marathon, starting and growing this blog, developing my first iPhone app, starting a podcast, and last year re-skinning games to earn money after I quit my full time job. For that time, that’s all I focus on. Once it’s up and running, then I’m able to pull back and bit and start on something new or move onto something else. There is no way I could go all in on every project at the same time. I’d be spreading myself too thin. Whatever you want to achieve, you have to be obsessed with it. I didn’t just kinda start a blog. I immersed myself in blogging. I didn’t just kinda do an app. I learned as much as I could. I didn’t just kinda reskin iPhone games last year. I spent the majority of my free time on it. So whatever you choose to do, go all in if you want to see results. Don’t go halfway. The work you put in will determine the results you get out of it. If you put mediocre work into it, you’ll get mediocre results. Twenty-one failures. That’s how many tries it took before I earned a profit. After that I still failed. I did go through a dry spell. Just seemed like nothing was working. I was spending money on Facebook ads without seeing anything in return. My lack of results and seeing others’ success was frustrating. The old me would have given up, doubtful I could do this. I’m glad I didn’t quit. If I quit, I wouldn’t have figured out a great design targeting the right audience, and sold $12,559 worth of shirts in one week in May. That week of selling inspired the same excitement as when Photo 365 was App of the Week. It’s easy to give up when things aren’t going right, but sometimes if you push through, then you’ll see your greatest success on the other side. What if you gave up right before that huge success? What if you were one step away? That would be a horrible feeling. Being in Facebook groups has really helped me learn. While I had the basic course to get me started, it was far from comprehensive. I learned everything on my own and from asking questions. It’s nice to have a place to get support and to learn from others. No matter what you want to achieve, don’t try and do it alone. Find support. It makes it easier. This might be the most important. I gave it a shot. When the opportunity presented itself, I had a decision to make. Try it out or wait for the right time? I decided to try it. I wouldn’t know I’d do unless I gave it a real chance. I’m glad I did. By at least trying, I would know if I liked this or not. I wouldn’t keep wondering if it was something I enjoyed. So many people are afraid to try because they’re afraid to fail. The biggest failure is to not even try at all. If you aren’t good with Photoshop or anyone similar program, you can outsource the design. Go to Fiverr.com for an inexpensive way to get started. Then roll up your sleeves and immerse yourself into the world of Facebook marketing and understanding what customers want. Finally, if you want to sell your own shirt, you don’t need to spend money on advertising. If you have an organization you’re trying to raise money for, Teespring is a perfect place to sell shirts. Just create a free account at Teespring.com, upload your design, choose the styles you want to offer, set your price, set your goal, set how many days the campaign will last, and when you’re done share that link on social media! 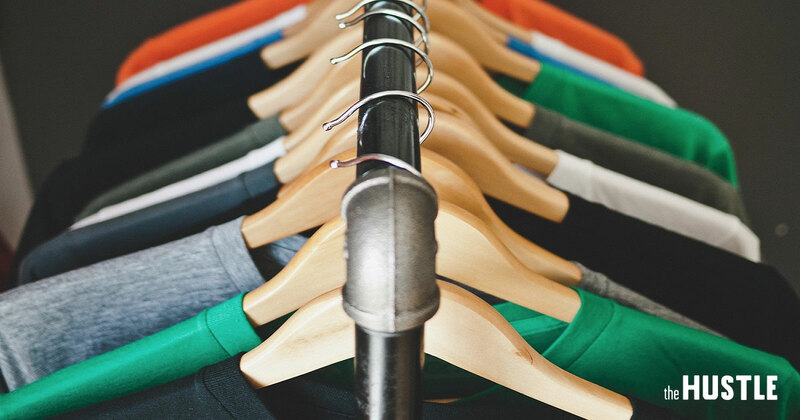 If you have a brand online and a passionate social media following, then you can design and sell a shirt. Just advertise it to them. No need to pay for advertising. Head over to Teespring.com and sign up for a free account to get started. There aren’t many limits to what’s possible with the resources we have today. The only limits are the ones we set on ourselves. Don’t make excuses that are stopping you from trying! You don’t need to get into the t-shirt business. There are so many ways to make money and actually enjoy doing it. I’m thankful that this has created a life of freedom for myself. It’s what I’ve always wanted and now that I have it, I certainly want to keep it this way.